I went to our Church’s Girls Camp this last week and had a blast! Over 30 women and girls together for 3 days in the mountains and we didn’t have one argument or disagreement! I am not lying when I say we have the best girls ever! 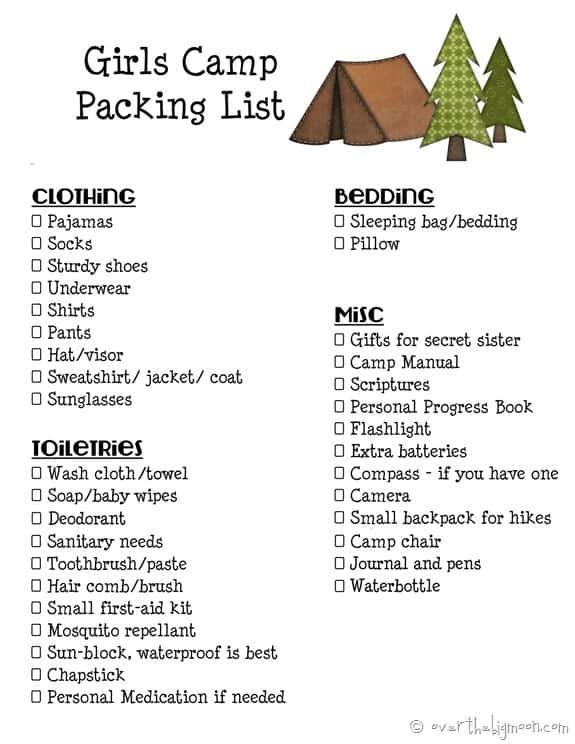 I made a printable packing list for the girls to take up that I wanted to share today. I also compiled a list of things that I liked that we did and also things I want to remember next time to take as a leader! If you are like us you probably don’t wear a watch anymore and use your cell phone instead. 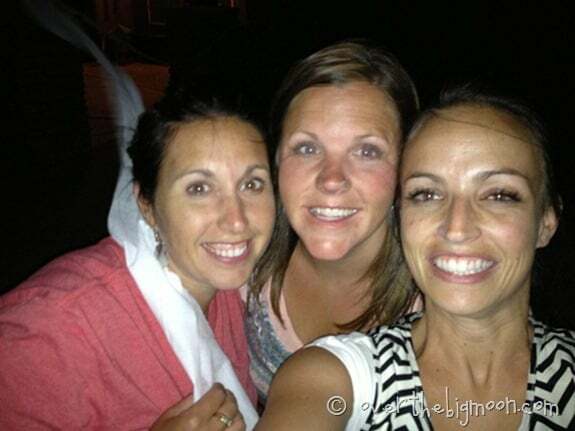 Without service and being in the mountains we didn’t carry our cell phones! It was maddening not knowing what time it was for everyone! Next time I will definitely bring a battery powered clock! Over-The-Door Shoe Organizer – This was perfect for the girls to put their secret sister gifts in. I brought blank index cards and they colored their own names on them and then we stapled them to the organizer. It worked great! We hung the organizer between two trees in camp. 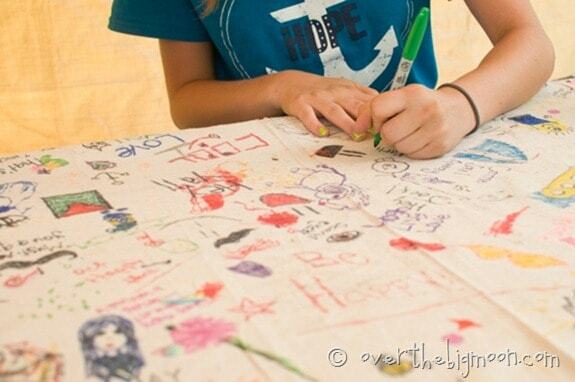 Canvas Drop Cloth and Sharpie Markers – One of our leaders brought a drop cloth and the sharpies and set it out over the tables as a tablecloth. The girls doodled and drew all they wanted. It was such a fun activity for them when they were just sitting around. It was also fun to look at! By the end of camp we had this great work of art from all the girls. 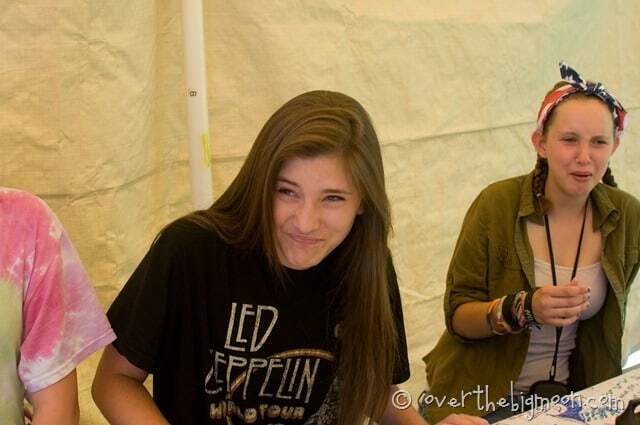 Plus it was a really nice tablecloth! 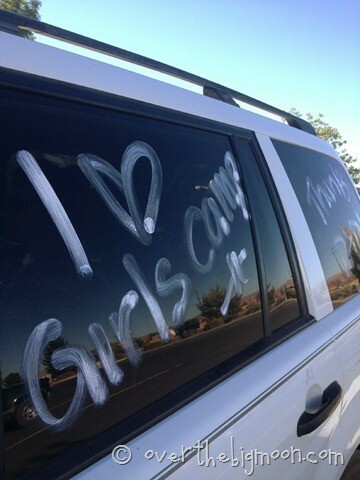 We bought window markers so when we were waiting for the other girls to show up the morning of camp we let them chalk up our car windows. It got the girls pumped up and excited! Hair elastics! 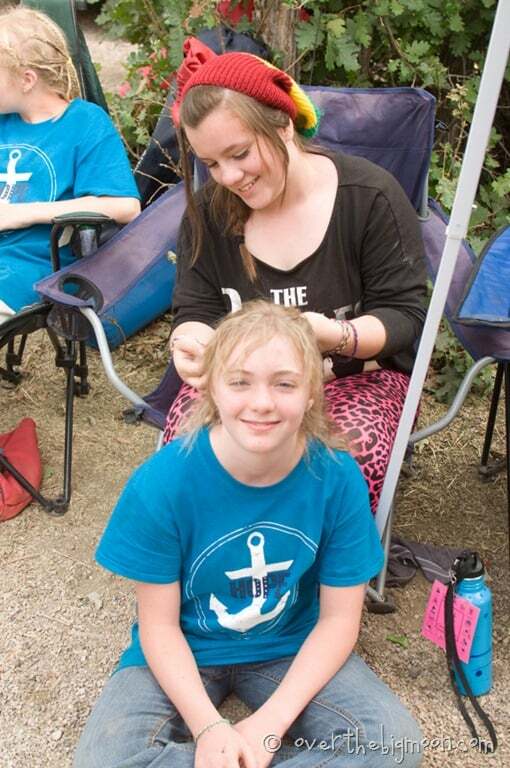 If your camp is anything like ours- there will be lots of hair braiding going on! Glow Sticks Galore! Each night we gave them some sort of glow necklace, bracelet, ring, or other fun glow in the dark accessory! We may have also broken some apart to make snipe pee in the bushes! Vibrating dog toy – We talked about taking one of these for the snipe hunt, but forgot. It would have been perfect to throw in the bushes and have it move and make noise. Next time I will definitely take one. One of our priesthood brethren had a coyote call that did make it a little more interesting! One of the men in camp was brilliant and brought a little stash of rope that could be cut to help tie sleeping bags closed because there were a lot of sleeping bag bags missing! It was really helpful to have something for them to tie their bags with. Or maybe it had to do with the pre-girls camp activities we engaged in. 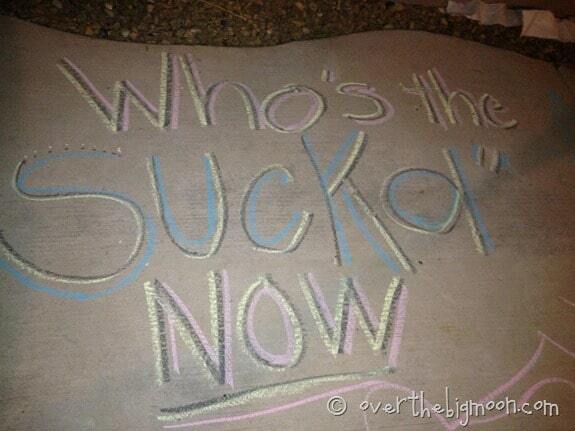 Toilet paper and chalk can be very handy! Oh and while you are at it…you might want to take some Oreos and white toothpaste and have a little “who can eat their Oreo first and whistle contest.” Its pretty awesome! While it may seem like we didn’t take camp very seriously – we did! But we also made it super fun for the girls! I feel so lucky to have been able to go to camp this year! I learned so much from our girls! Come back on Monday for some other fun ideas and printable tuck in treat tags! Was that a whole week? I was wondering if it is possible to get this file editable. I love your ideas but need to add a few like a swim suit and such? Hey Sheri- at this time it’s not available in an editable form. 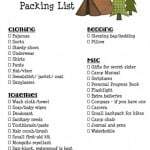 But, you could just take it into photoshop or another editing program and add some add on items on the bottom of the categories. Thanks!